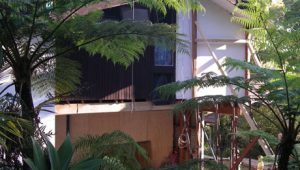 Caravan Renovation Perth – We spent Easter packing up everything and moving it to my folks’ place – for better or for worse. 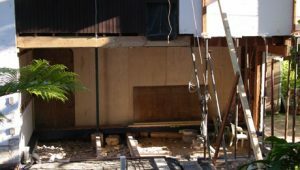 A few weeks ago, we went over to my folks’ place for lunch and explained all our dramas – mainly, the fact that we’ll need to move out during the rest of the reno. And they weren’t surprised at all. As Mum said, she couldn’t believe we’d lasted so long. I guess Frank was secretly hoping they’d let us borrow a bit of money to pay rent for four or five months, but really, he seems to live in his own little world. My folks happen to have an old caravan parked out behind the garage, and they thought we should move in there. Frank and I looked at each other – absolutely stunned – as the kids jumped for joy. They reckon it will be like a holiday, especially when they get to watch telly right above the bed. They didn’t even complain that they’ll have to share one double bed. The kitchen is pretty tiny, but as Mum said, we can always cook and have a shower inside the house. It’s going to be incredibly small – I mean, cosy – but it’s absolutely clean and I won’t wake up to the sounds of drilling and sawing at 7am. Another bonus is that we don’t need to head to the laundromat anymore. And even more importantly, I’ll never need to share a Port-a-loo with the builders! So, we spent Easter – well, just one day – moving all our clothes, toiletries and linen into the caravan. We left all our other furniture at home but we remembered to cover them with plastic dropsheets to avoid dust. And builder Jeff was relieved when we moved out. We had a progress meeting last week, and he gave us the delivery dates for appliances, etc. I showed him my list of products with a lot of things ticked off. So since we’ve moved out, Jeff and the team have worked with gusto. They’ve demolished the entire back wall now, and the bedrooms upstairs are now held in place by great big metal supports. 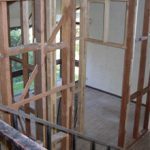 The upstairs bathroom was gutted in half a day. They have also been excavating the ground in preparation for a large concrete pour that will make up our beautiful polished concrete kitchen floor. Jeff told us that if we want underfloor heating, we had to make the decision now. It had to be in place before the pour and could not be added after. We looked at the cost, looked at our bank balance and told him we’ll live without heating. Concrete floors feel lovely and cool underfoot in summer but can bit pretty chilly in winter. Unfortunately we simply couldn’t stretch out budget any further to include the heating. Frank’s solution was elegant and simple – just buy the whole family Ugg boots! 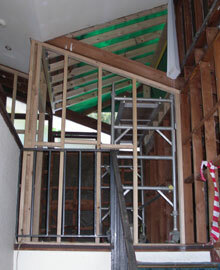 Since the renovation of the upstairs bathroom sprung up on us so suddenly, the planning has been a bit of a rush job. Though I’m pretty happy with what we’ve decided. The cupboard at the top of the steps will be removed and the extra space incorporated into the bathroom. The bath will be moved to the back wall and – here’s the brilliant bit – the small room that housed a separate toilet will be turned into a shower recess. And naturally, the toilet will be placed where the shower used to be. It means that when you open the door, you don’t look straight at the toilet. Jeff also came up with a fantastic idea to create more light and space. The ceiling was really low, so he decided to extend the windows above the stairs. Luckily, the windows are so high, you don’t look into the neighbours’ house, and it means we can have a clear window, not opaque. And best of all, it matches the cathedral ceiling design in the original house.